“Every year, at this time, thousands of American families remember the loved ones whose lives have been taken – our children, parents and grandparents – by avoidable hazards on the job. Even though the Occupational Safety and Health Act has been the law of the land for more than four decades, we still have much to be done to make work safer, particularly in the construction industry. In 2012 – the most recent reporting year – construction fatalities rose 5 percent over 2011. It was the first annual increase in six years, resulting mostly from transportation incidents, such as highway flaggers being struck by cars, and from falls, trench cave-ins and equipment mishaps. 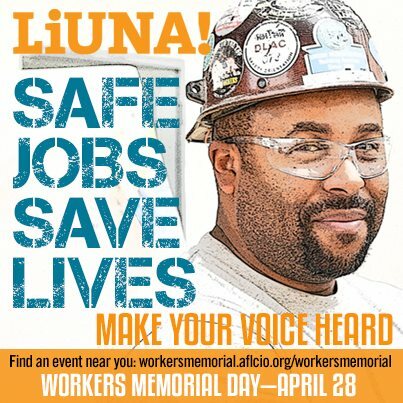 In LIUNA alone, 73 members have been victims of fatal construction accidents since 2008. In addition to accidents, workers are needlessly exposed to dangerous materials. In 2013, we made significant progress in limiting exposure to silica and look forward to implementation of a silica safety standard.